I’m not sure what the quilt police would say about this. 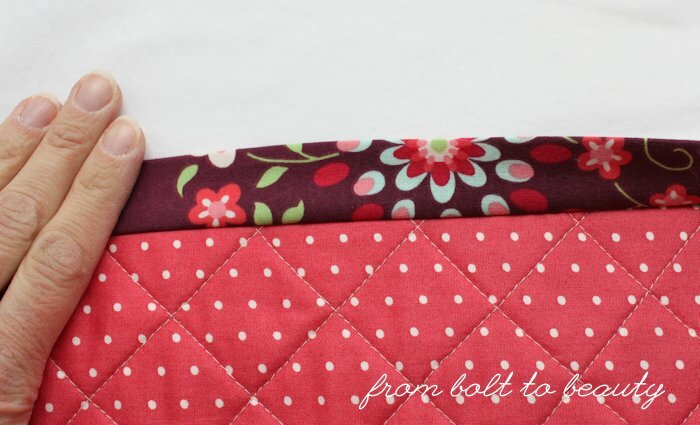 When I started quilting, I knew that a hand-stitched binding was not for me. I didn’t have the patience for finishing a binding by hand, and I wanted the durability of a machine-stitched one. 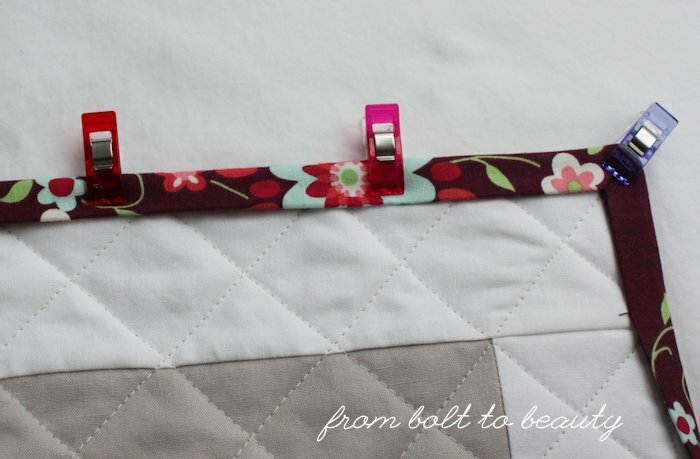 I’ve tried just about everything when it comes to binding quilts ... Attaching to the front and then the back, attaching to the back and then the front. Sewing a straight stitch, sewing a zigzag stitch. Stitching in the ditch, stitching so there’s visible thread on both sides of the binding. Using pins, using glue, using clips, etc. My current approach is to attach the binding to either side, the front or the back. It’s not for everyone. I’m sure that thread line parallel to the binding, which in this quilt appears on the back, would drive some of you batty. 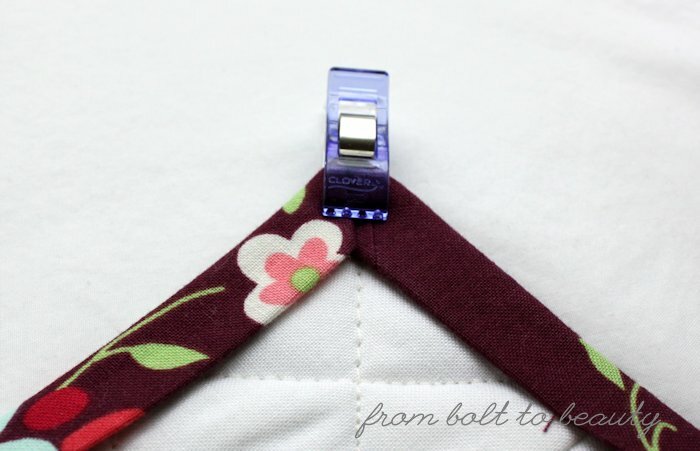 Plus, this approach often requires different colors for the top thread and bobbin thread. I don’t mind tempting the tension gods (they tend to cooperate with me! ), and I like this technique because it’s pretty forgiving. What follows are more details on how I bind this way. It’s a high-level view of the process. 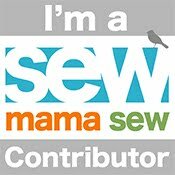 If you want the nitty-gritty details—making your binding, mitering your corners, etc.—there are links at the end of this post to other tutorials. 1. Attach the binding to the front or back. First I determine which side to attach my binding, picking the one that will better camouflage the line of stitching that runs parallel to the binding. (See the first pic above.) Then I sew my binding on that side, mitering the corners as I go. I like to set my stitches first by pressing the seam; I think it makes the fabric more malleable and creates a crisper fold. Then I fold the binding away from the side I’m working on, creasing the fabric with my fingers, and press again. 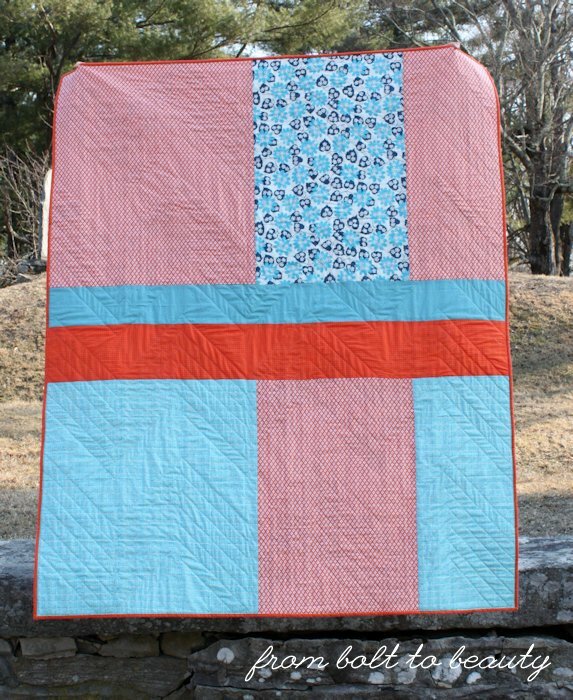 When I bind a quilt, I work on one of the four edges at a time, so I will press one edge and then sew it down before pressing and sewing the next. To keep everything in place, I glue-baste my corners. Using washable school glue, I squeeze a thin line of glue along the corner, fold the binding over it, and use my iron to set the glue. First I apply the glue. After I set the glue with my iron, I still use a clip for good measure. 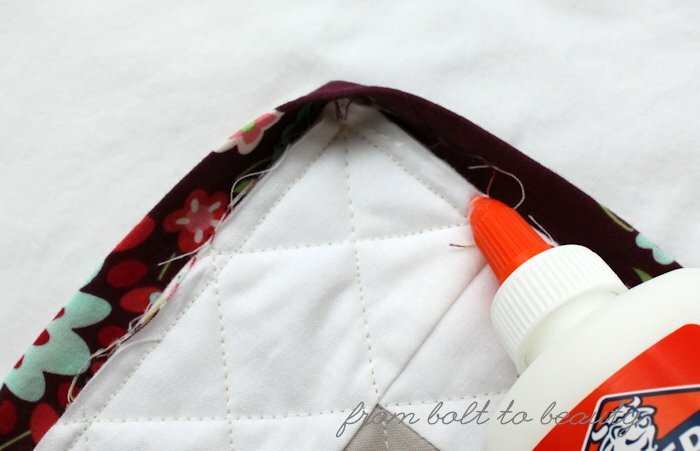 Since I work on one edge of my quilt at a time, the first edge entails gluing two corners. The next two require gluing one corner down. By the time I’m on my last edge, all the corners have been glued down and sewn, so there’s no need for more glue. 4. Clip the rest of that edge. I used to glue-baste all around my binding, but it was messy and I didn’t think the results I got were worth the hassle. Now I like the quality I get by clipping the binding down before sewing. I give myself ample wiggle room here. When I sew along this edge, I have plenty of clearance; I rarely catch the other side of the binding in the seam accidentally. Whatever did we do before Wonder Clips? 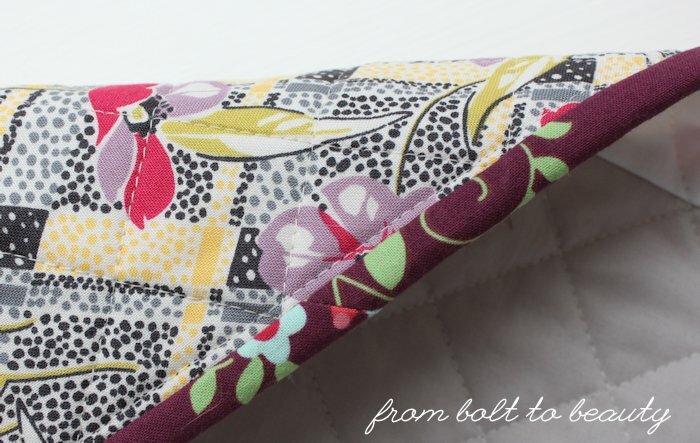 I back-stitch at the beginning and end of that edge, and I pull the quilt off my machine to prepare the next one. 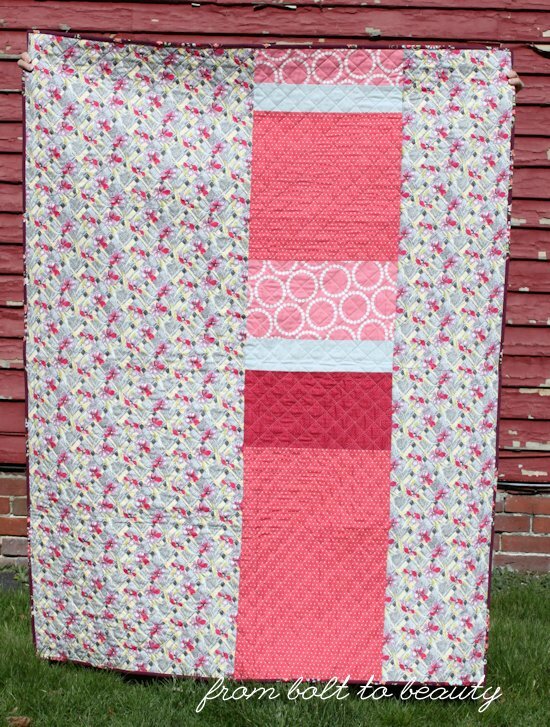 The finished quilt on location at Pintuck and Purl. 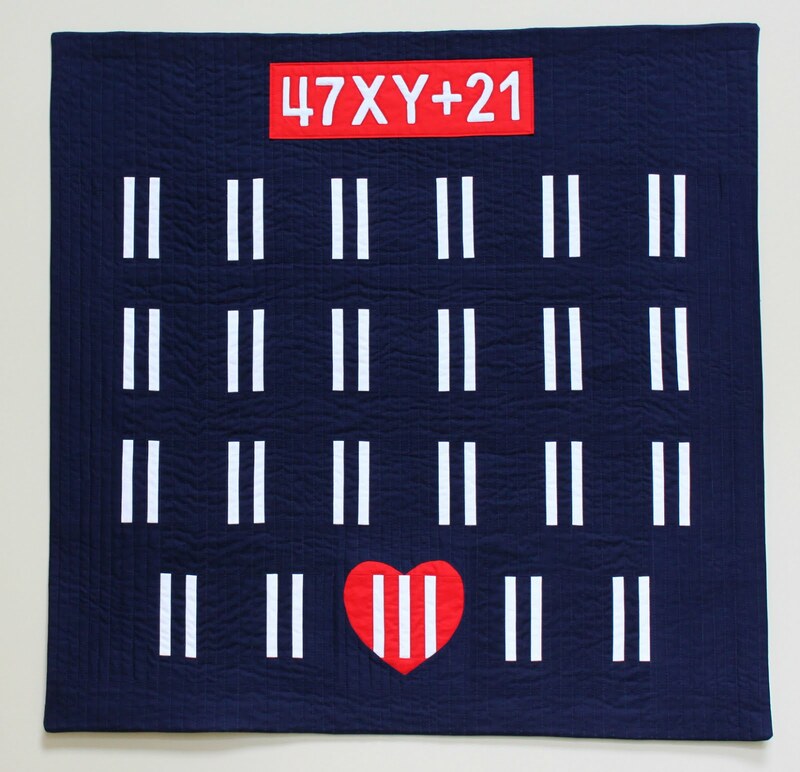 For more on this quilt, see this post. In my mind, choosing how to bind your quilt is a matter of preference. Everyone does it a little differently, and perhaps by peering into my process, you might tweak your own protocol. But what would the quilt police say? I have never entered a quilt into a show before (confession: I have never even been to a quilt show before! ), and I wonder if my approach to binding would be judged negatively. What do you think? * Karen’s Quilts, Crows, and Cardinals: This is my current go-to tutorial. It’s long but has lots of helpful pictures. I’ve only ever followed it to do a flanged binding here. 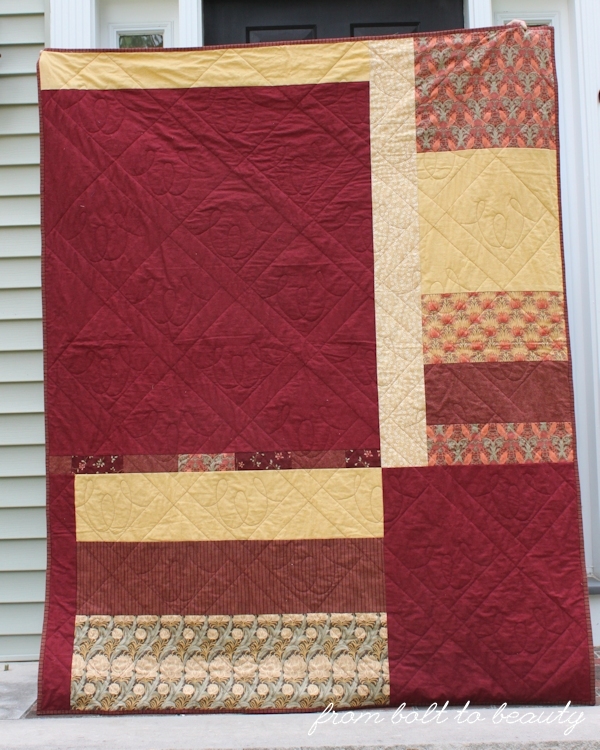 * Red Pepper Quilts: I used to zigzag the raw edges of my binding as done in this tutorial. Now I can’t be bothered with that extra step. 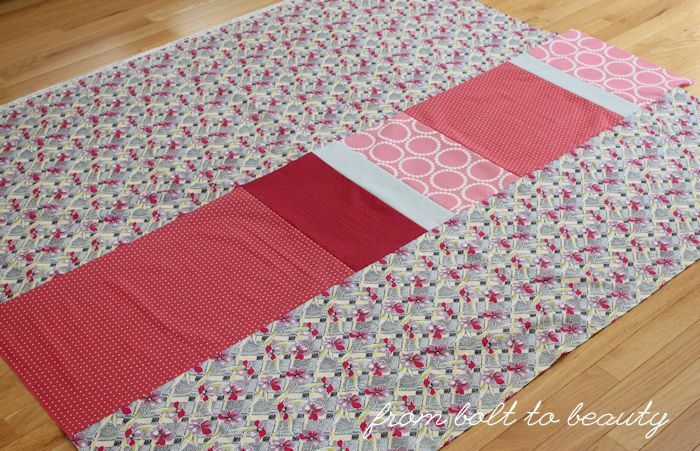 * Jaybird Quilts: I follow this tutorial when I can get away with a single-fold binding. * Stitched in Color: I’ve tried using a decorative zigzag stitch to finish off the binding, but I get less-than-stellar results. There are many things to celebrate with this finished quilt. 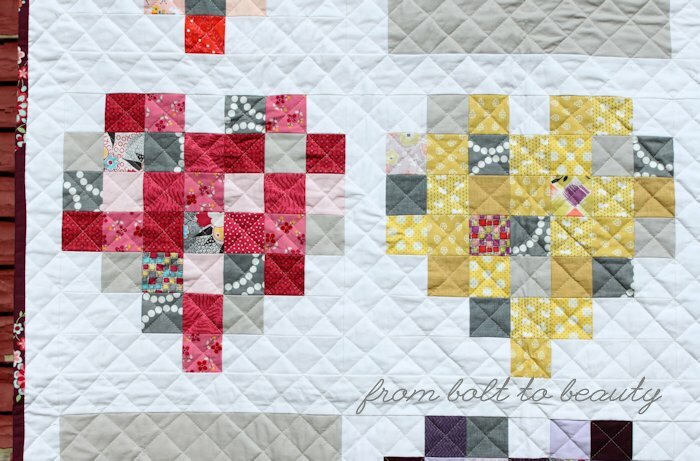 I used a bunch of scraps in the hearts and pulled almost all the other fabric from my stash. 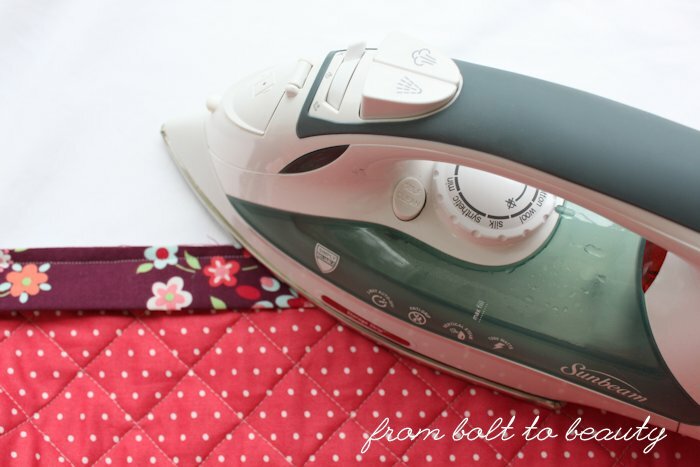 I quilted the fabric that was fused with the Pellon product with success. Now I have a throw I can gift to a friend who has no idea it’s coming her way. Just-because gifts are the best, aren’t they? To learn how I piece my backs, click here. 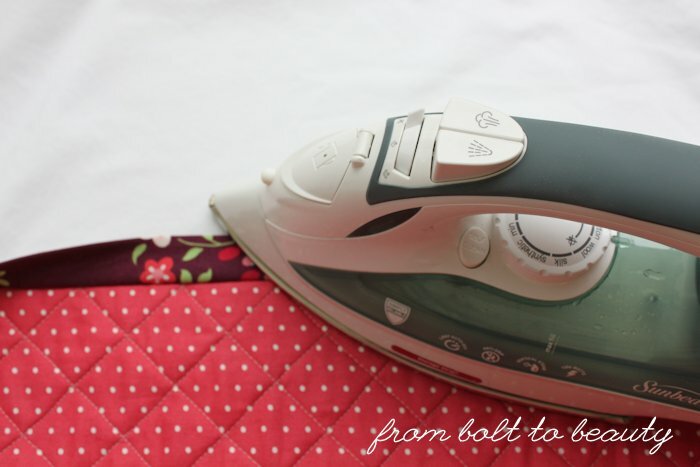 Fabric fused with interfacing behaves differently than straight-up quilting cotton. Most of the time, we use interfacing to make a fabric more substantial, to give it body and a firmer hand. That’s great for a bag project, but if you interface your quilting cottons, you can’t fudge things you might otherwise. There isn’t any give, making the fabric less willing to be coaxed into submission. 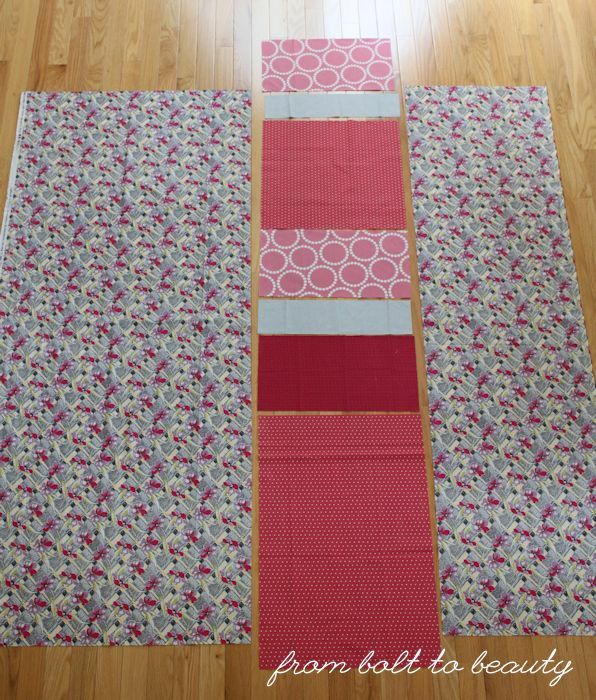 If you’re going to fuse your blocks, you’ll have to fuse the whole quilt top. When I started making my pixelated blocks, the quilt design wasn’t fully developed. Once I decided upon the big solid squares and sashing, I knew I had to back them with the same interfacing. 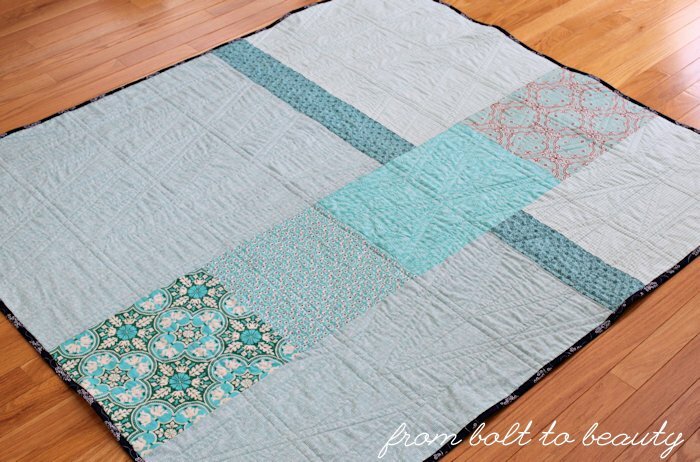 The Pellon product doesn’t drastically change the hand of quilting cotton, but it does add some weight and a quilt top of some fused fabrics and other nonfused fabrics wouldn’t have worked. It wasn’t hard to fuse the interfacing to those other fabrics, but it seemed to defeat the idea of using the interfacing with the heart blocks to save time. And I did have a leftover heart block. Incorporating it in the quilt back wasn’t an option—there was no way I would interface the yards of other fabric I used there! Amazon Prime’s contracts with the BBC may affect your productivity with such a project. 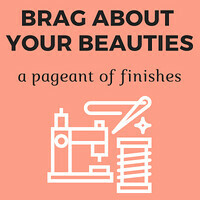 What do you do while you sew? Do you Zen out and become one with your project, or do you, like me, need a distraction? I’m in between streaming shows right now and have been listening to the Hamilton soundtrack instead. Any suggestions? 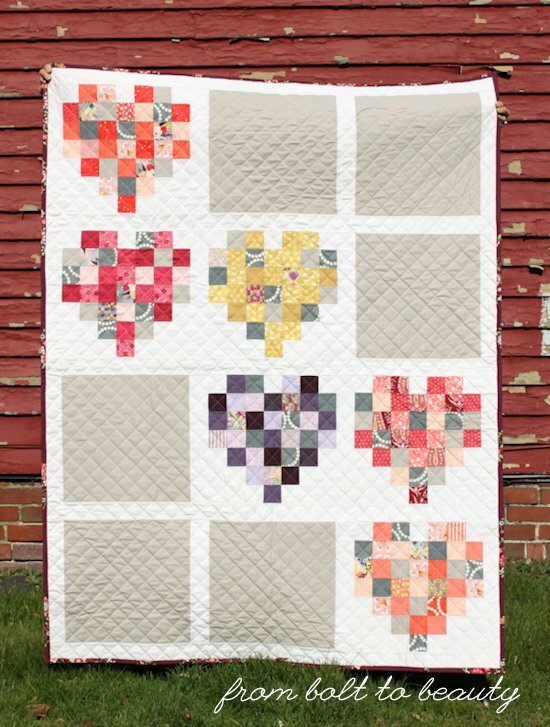 I love the look of a pieced quilt back. 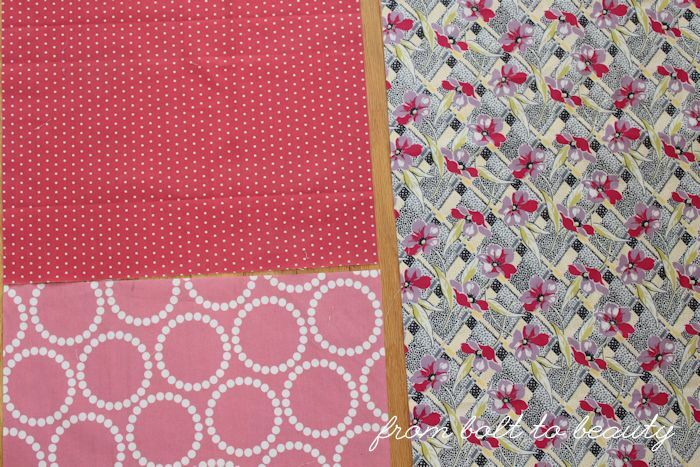 In fact, there have been times when I’ve had enough of one fabric to make an entire back and have chosen to cut up that yardage, incorporate other fabrics, and piece one instead. 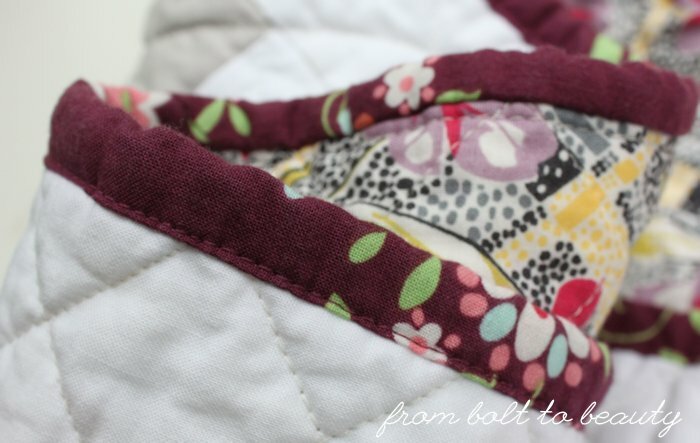 What’s better than one pretty fabric on the back of a quilt? When it’s time to make my back, the recipe I follow is simple. I take a 2-yard cut of fabric and cut it length-wise. (I don’t bother removing the selvages.) I don’t like things to be too symmetrical, so I’ll cut the length about 25 inches from the left edge. Then I figure out how much fabric I’ll need to add to the center to accommodate the width of the quilt top. I head to my stash, and sometimes my scrap bin, to find coordinating bits. I sew them up in a column and attach the sides. Everything is laid out and ready to be sewn. I like this approach because it produces a chunky back, one that doesn’t compete with the top for the spotlight and one that’s not too fiddly to sew. This technique also helps me be a smarter stasher. When I find a fabric on sale that would work well as the main fabric in a pieced back, I buy a 2-yard cut of it. Most of my quilts are throws, so by buying 2 yards, I’m stashing enough fabric to cover the length of a throw-size quilt plus a few inches of overage. Ta da! One lovely pieced back. Click here to read more about Good Day Sunshine. 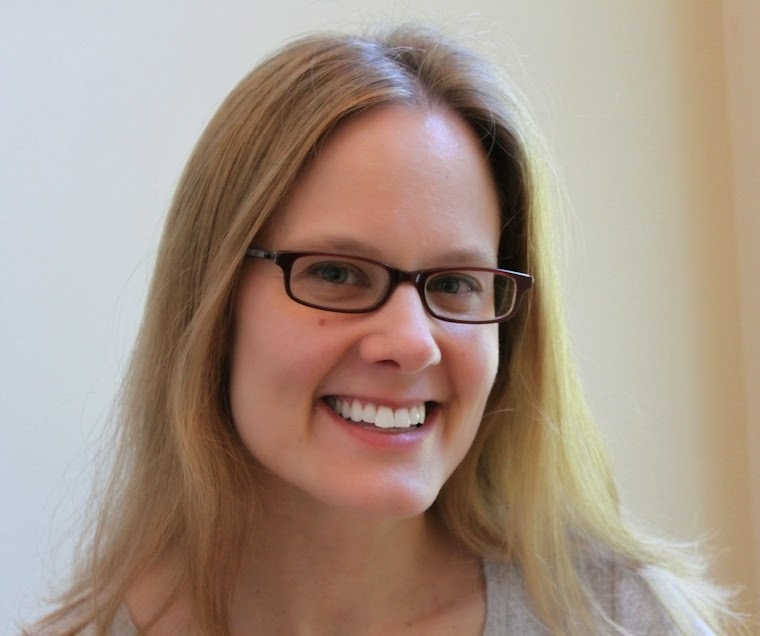 Click here to read more about Lotus Blossom. How about you? Do you piece your backs? And if you do, what trends can you identify in your approach?